Rankin, William. 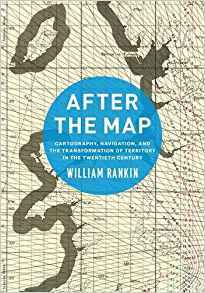 After the Map: Cartography, Navigation, and the Transformation of Territory in the Twentieth Century. Chicago and London: University of Chicago Press, 2016. 398 p. $55.00. LC: 2015037815. ISBN: 9780226339368. In After the Map, William Rankin studies the histories of three major international 20th century projects — the International Map of the World (IMW), Universal Transverse Mercator (UTM), and the Global Positioning System (GPS) — through the lens of what he terms “geo-epistemology.” Rankin focuses on changes in the kinds of information produced by these projects, investigating “not just what is known about the earth, but how it is known and how it is used.” In the book’s introduction, he sets forth his intention that the book function as “a global history of geographic knowledge from the late nineteenth to the early twenty-first century,” as a “history of territory,” and as a means of building understanding of “a new kind of infrastructure — one that is successful exactly because it transcends the military or diplomatic strategy of any individual state.” Owing to the scale and reach of IMW, UTM, and GPS, their array of developers and stakeholders, and their implications for geographic knowledge and impacts on understandings of territory, the stories of these projects are an ideal means by which to accomplish these goals. The book is divided into three sections, with two chapters apiece devoted to international cartography projects (dominated by the rise and decline of the IMW project), developments in geodesy (emphasizing UTM), and developments in navigation (emphasizing GPS). These sections function well enough as stand-alone histories of the three systems, and as discussions of 20th century trends in their respective fields, that, as a cataloging librarian, I was prompted to locate the book’s WorldCat record and enter additional subject headings to more thoroughly reflect these aspects of the book. Rankin is particularly attentive to naming and highlighting the contributions of individual mapmakers and engineers (“wonks”) and their supporting institutions, but is careful to distinguish their agency from intentionality (“I make no claim that they saw — or even cared about —the larger trajectory presented in this book.”) Each chapter begins and ends with brief texts clearly contextualizing the events described within the book’s main thematic interests. The book is illustrated with numerous well-chosen black-and-white illustrations, primarily of maps, and includes a 12-page section of color plates that duplicates illustrations for which color is necessary to understanding. Major themes of the chapters on the IMW include the project’s particular claims to ideals of neutral, authoritative representation and scientific legitimacy; the intention that the IMW function as a base map suitable for addition of specialized content, and its ultimate failure to meet the needs of many specialized users, particularly aeronautical constituents; the impact of World War II on popular and military cartography; and a pragmatic tendency toward regional standards (instead of the IMW’s single international standard) that gradually left the IMW without a clear user base. In the sections on UTM and GPS, Rankin directs considerable attention to the antecedent activities and systems that gave rise to each, with a chapter apiece on pre-UTM grids and pre-GPS radionavigation. Both sections also detail significant transitions from military innovation to civilian adoption and proliferation. Other major themes in the chapters on grids and UTM include the strong interwar distinction between a national-practical realm and an international-scientific realm, and concomitant resistance to imposition of international standards that would interfere with national needs; and the U.S. military’s post-WWII drive to install UTM worldwide. The section on GPS details a similarly dominant role for the U.S. military in its development, and in that context includes consideration of the implications of its widespread embrace for diverse civilian uses. Rankin concludes the book with four complex questions arising from his work, each proposing promising paths for additional research and writing. After the Map is an important work of scholarship, contextualizing valuable and well-written histories of these major international projects such that they extend readers’ understandings of their impacts. It will be a necessary acquisition for map libraries and is recommended for academic libraries generally.